No coding skills required. No requirement of WordPress expertise. Now you can easily manage and list out posts for your WordPress sites by using Eight Degree Posts List. 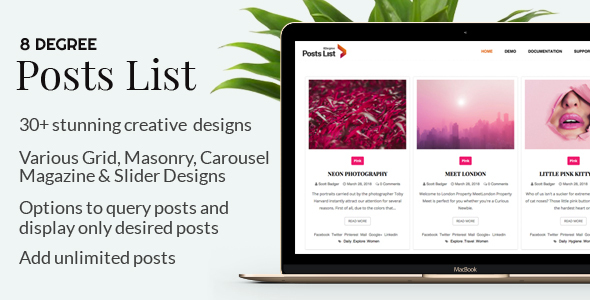 The best plugin to manage and list out posts – “Eight Degree Posts List” allows you to display your posts with over 30 powerful and creative designs. Not only does this plugin provide a pleasing outlook to the front end, it also eases your work at the backend. It is extremely flexible to set up and users always have options to choose according to their requirement generating posts to the frontend. Also, Eight Degree Posts List plugin is based on WordPress Custom Post type, meaning – the settings you set in Eight Degree Posts List plugin are saved as any standard WordPress posts. So you can create as many variation of the settings as you like. 9 pre-designed beautiful, responsive grid templates ready to use. Full controls of columns in desktop, mobile or tablet. 3 pre designed ready to use masonry templates. Manage variance of posts in style. 7 pre designed magazine templates. 6 pre designed carousel templates. 6 pre designed Slider Template with mobile touch response. 5 stunning post filters to introduce your blog posts in a unique way. Easy load more pagination options to order your blog’s posts. Enable/Disable the posts categories,tags,author, comment count and date. Enable or disable the share link of posts in different social media. Options to query posts and display only desired posts. Build with WordPress Custom Post Types. This entry was posted in expressionengine, miscellaneous, plugins and tagged blog design, blog manager, carousel layout, Content block layout, custom field blog, Filter Blog Category, grid layout blog, list layout, magazine layout, Masonry layout, pagination, slider layout, wordpress blog manager by dadmin. Bookmark the permalink.